A sturdy portable drive slimmer, if not more advanced, than older models. The Toshiba Canvio Advance is an external hard drive that comes in 1TB, 2TB and 3TB capacities. This is not a drive to buy if raw performance is the main concern. However, it does offer a lot of storage for not that much money. And it’s much more portable than a traditional desktop external hard drive. It’ll fit in the back pocket of your jeans. Just don’t sit on it. People’s hard drive preferences often boil down to which brands haven’t failed on them in the past, but complaints here are minor. You’ll pay $53.99 (£54.99, about AU$65) for the 1TB version, $72.99 (£79.99, around AU$90) for the 2TB. The pricing is comparable to Western Digital’s WD My Passport range. Portable hard drives are like spare keys. They are not particularly exciting, but when you need them you really need them. The Toshiba Canvio Advance is a middle-ranking model in the Toshiba line-up. It doesn’t look as dull as its Basics drives, but is not as flashy as its aluminium Premium ones either. Its outer is plastic, with a glossy finish on the top. You can get it in black, red and blue as well as the white seen here. Compared to the WD My Passport X we occasionally use to ferry about files, the Toshiba Canvio Advance is very slim. It uses two platters and is a 2.5in drive, letting it slim down to 14mm thickness, according to both Toshiba’s specs and our tape measure. Upgrade to the Canvio Premium and you shave off an extra 0.5mm and get an extra USB-C cable in the box. But that, aside from the aluminium outer, is about it. The LED up top is one part that may start dividing you. Plug the drive in and the ring in one corner glows blue. It flickers as it reads or writes data. This looks nice enough, but may not be wanted if the Toshiba Canvio Advance will spend its life under a TV with the rest of your home entertainment gear, rather than living plugged into a desktop or laptop. As with a lot of portable drives, the Toshiba Canvio Advance’s cable isn’t that long either. It measures around 45cm from the end of one terminal to another. There’s limited scope to hide this drive. And as it uses an old-style microUSB 3.0 port on the drive itself, it’s unlikely many will have a suitable spare lying around. The cable ends in a standard USB port — bear this in mind if you have a new laptop that only has USB-C connectors. The Toshiba Canvio Advance comes ready to plug into a Windows computer. That means it’s formatted to the NTFS file system, which makes the drive read-only if used with a Mac. Reformatting it for Mac use only takes a minute or so using OS X’s Disk Utility, but this point is worth considering for those buying for someone with limited tech chops. Toshiba makes a version of its Premium model pre-formatted for Mac use. Does it work with game consoles? We tried the Toshiba Canvio Advance with both an Xbox One and PS4. It was successfully recognised by both. However, to use it with a PS4 you’ll need to format it to the FAT32 or exFAT file formats. The Xbox One does the job for you. If you’re buying for a Windows system you do not need to do anything, though. All that comes on the drive as standard are a couple of documents and a web link, from which you download the two pieces of “included” software. There’s a backup utility that makes the Toshiba Canvio Advance auto-copy files from Windows folders you select, at an interval you choose, and a security app that lets you password protect files. Both are basic, and lack the supplementary cloud some drive manufacturers offer, but are quite easy to use. You don’t get anything in the box bar the drive and the cable, because the Canvio Advance is powered by the USB port. Like other 2.5-inch drives, no separate power supply is needed. If you want amazing file-juggling performance, the Toshiba Canvio Advance is not the drive to buy. Even a budget SSD will be much faster. However, it does offer decent performance for a 5400rpm 2.5in spinning platter hard drive. When transferring large files it writes at 122MB/s. Transferring 10GB of data will take around a minute and a half. Spinning platter hard drives are impacted quite dramatically when transferring lots of smaller files, though. It takes 271 seconds to copy over the 23GB, 5376-file Steam install of Alien: Isolation, for example. This gives it an average of around 85MB/s. Write speeds level out at 141MB/s, which again is the norm for a 5400rpm drive. You’ll see slightly better results from a larger 7200rpm desktop drive, but we do mean slight. We’re talking about read/write speeds around 150MB/s. If you need much faster speeds, you’ll haver to stump up for a 2.5in SSD. But for the price of a 2TB Toshiba Canvio Advance you’ll only get a ~250GB SSD. Hard drives may be relatively slow, but they still have their place. And unlike old hard drives, the Toshiba Canvio Advance’s read/write noise is barely noticeable, particularly if there’s a laptop/desktop/console fan whirring away nearby. 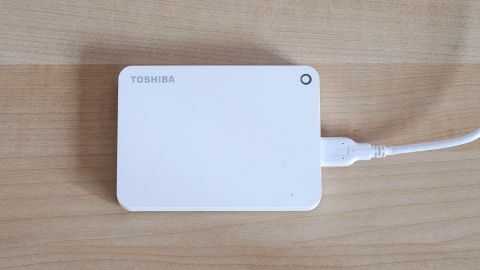 Toshiba is so confident of the drive’s low-noise, low vibration operation there are no rubber feet on the bottom, just plain plastic. At one point during testing the drive did cause a buzzing noise, but this was only because it wasn’t properly seated. Unlike an SSD, spinning platter hard drives should really be used flat and not be moved about as they are whirring away. The last point to note is our performance results only apply when used with a USB 3.0 port on your desktop or laptop. If your computer only has USB 2.0 ports you’ll be limited to the 480Mbps (60MB/s) limit of the old standard. The Toshiba Canvio Advance is a solid, highly portable drive for backup and laptop or desktop overspill. It’s a few millimetres slimmer than old models, but don’t buy one expecting substantially better performance than other USB 3.0 drives. There are a fair few things you need to consider when thinking about buying the Canvio Advance. Do you need a USB-C cable? You don’t get one here. Will you find the LED distracting? And do you need a drive pre-formatted for Mac use? Pass all those tests, however, and you’ll find the Toshiba Canvio Advance a convenient and portable way to boost your computer’s storage.